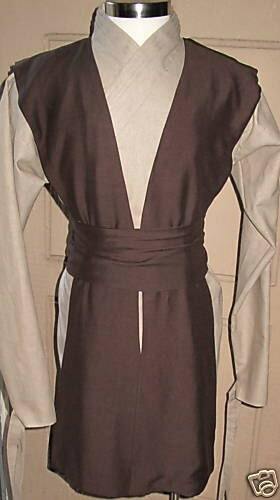 JEDI under tunic shirt, 2 tabards and a sash/obi. THE FIBER CONTENT: BEIGE MEDIUM WEIGHT LINENS, FINE RAYONS OR BLENDS WHICH EVER FIBER IS IN STOCK THESE COLORS. THE SHIRT HAS FACINGS, AND IS NOT LINED, HOWEVER ALL EDGES ARE OVER LOCKED. THE SLEEVES HAVE 56 INCH LONG TIES AROUND THE WRIST FOR ACCURACY. THE TIES WRAP AROUND THE WRIST AND UP THE ELBOW AS SEEN IN THE PICTURES. ALL SEAMS ARE UNDER STITCHED WHERE IT APPLIES TO MAKE THE SEAMS LAY FLAT. ALL GARMENTS ARE PRODUCED ON INDUSTRIAL MACHINES AND STEAMERS TO ACHIEVE THE QUALITY DESIRED. THE COLLAR HAS 3 TUCKS FACING UP TO GIVE IT MORE INTEREST LIKE THE OBI WAN EPISODE 3 SHIRT. THIS SHIRT IS FOR THE BROWN TABARDS AND A SASH WITH A UTILITY BELT HE WEARS AS A JEDI. THIS CHARACTER HAS SEVERAL COSTUMES DEPENDING ON WHETHER HE IS A JEDI MASTER OR A SITH. A KIFFER JEDI MASTER IN THE JEDI ORDER AND A GENERAL IN THE GRAND ARMY OF THE REPUBLIC DURING THE CLONE WARS.HR HAILED FROM THE PLANET KIFFER IN THE INNER RIM TERRITORIES. VOS WAS GIFTED WITH PSYCHMETRIC POWERS WHICH ALLOWED HIM TO READ MEMORIES FROM INANIMATE OBJECTS THROUGH PHYSICAL CONTACT. VON HAD AN ONGOING STRUGGLE WITH THE DARK SIDE OF THE FORCE. ANY QUESTIONS , PLEASE ASK. I DO CUSTOM ORDERS. IF YOU WISH TO USE YOUR OWN FABRIC, I WILL CHARGE FOR LABOR ONLY. medium = 36" to 38"
large = 40" to 42"
xlarge = 44" to 46"
1X = 48" to 50"
2X = 52" to 54"
If I have forgotten anything please ask.